Is Libya Sarkozy's De Gaulle moment? If the art of politics is about seizing the moment, then the French president Nicolas Sarkozy has certainly grabbed this one. First of all, he went out on a limb in officially recognising the Libyan opposition. Then he corralled the international coalition, pushed through the no-fly UN resolution, and bombed Muammar Gaddafi's tanks outside Benghazi. A week later, though, military leadership of the alliance has now passed to the US and Nato - France still carries a kind of moral aura thanks to its early championing of the cause. It's the sort of moment that makes the French people feel good about themselves. This is a country with a very high view of its own mission in the world. But the opportunities for gunboat humanitarianism are not frequent, and up to now it has been Washington that has led the way. This time it is France doing what the French believe France is supposed to do, thanks to a president who may be impetuous - but at least knows how to act. So is this, as some are saying, Mr Sarkozy's De Gaulle moment? A chance for him to transcend the petty bickering of domestic politicians, and place France back where it belongs among the pantheon of nations? And if it is, does that mean that his own political fortunes are saved, and that he can start planning for next year's presidentials with a renewed sense of hope? The initial omens are good. French intervention in Libya is supported by all the main political parties, with the exception of the Communists and the National Front. In the nation as a whole, some 66% are in favour, according to a poll published on 23 March. 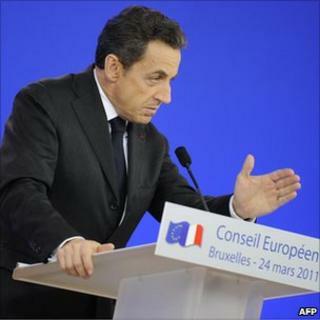 Two weeks ago - before Mr Sarkozy moved into top gear - the same proportion was actually against French policy. Even the president's enemies have been forced to admit that he has been impressive. Bernard-Henri Levy, the Socialist-voting celebrity philosopher whose trip to Benghazi sparked Mr Sarkozy into action, described the president as "clear-sighted and courageous". The left-wing press believes Mr Sarkozy is exploiting the occasion in order to "re-presidentialise" himself and distract opinion from domestic problems. But it does not question that his decisions were the right ones. And others are outright fulsome. According to Christophe Barbier, editor of the centre-right L'Express magazine and no fawning mouthpiece, Mr Sarkozy will be remembered "as the leader of the G8 who at the last minute managed to manoeuvre western democracies into action against Gaddafi's madness. "If the end result is a victory - in other words if the Gaddafi regime collapses without giving way to trivial chaos, then Nicolas Sarkozy, in Benghazi as well as Paris, will be hailed as the liberator. "In advance of all the rest, he launched a war of the just." Such praise is rare indeed for the president, and it would be churlish not to let him enjoy it. Because, let's face it, the euphoria is unlikely to last. De Gaulle was a French general and statesman. In 1940, as under-secretary of national defence and war, he refused to accept the French government's truce with the Germans. He became leader of the Free French and left Paris for London. In June, he broadcast an impassioned call for resistance to the Nazi occupation of France from the BBC's headquarters. The rallying cry was to become known as 'l'Appel du 18 Juin'. The initial phase of the Libyan campaign has been dramatic, exciting and effective. But looking ahead, what guarantee is there that the news will stay as good? If past experience is anything to go by, the campaign will be punctuated by frustrations, reverses and the occasional blunder. A neat conclusion, with Gaddafi toppled by a palace coup and the Libyan nation uniting behind a new democratic government, cannot be ruled out. But it is not exactly the most likely outcome. As the political sage Jacques Attali put it this week: "The only way to play chess is to look several moves ahead, and that's not what those who launched this conflict appear to have done." Public opinion is fickle. Some may recall that it was a noble instinct that prompted the call to action. Most won't. But there is another reason the president is unlikely to reap many dividends from the Libya episode. Sarkozy may be trying to act in a De Gaullian manner, but he is quite evidently not De Gaulle. The main reason Sarkozy has been so low in the opinion polls is not so much what he has or has not done, but the simple fact that many French people do not like him. That is not going to change - however decisive the president's actions. The French nation had a bond with Charles de Gaulle, as it also did - albeit to a lesser extent -- with subsequent presidents like Francois Mitterrand and Jacques Chirac. It is hard to detect any such bond with Nicolas Sarkozy. Right now many people admire what he is doing, and they are grateful that he has made France stand tall. But, it seems, they are not about to take him to their hearts.